The Family and Medical Leave Act (FMLA) is more than 20 years old, but surveys show that it still ranks as one of the most confusing and frustrating employment laws for companies to administer. And, in those 20 years, employees have learned how to use the FMLA to their advantage. It’s important for you and your managers to understand whether an employee’s request for leave could qualify as FMLA leave and how to respond once an employee is on leave. That’s why it’s vital for your organization to have a strong FMLA policy in place. 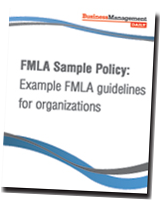 Fortunately, we’re offering our FMLA Sample Policy: Example FMLA guidelines for organizations FREE to highlight the importance of complying with the FMLA. This sample policy outlines a company’s rules for employees taking leave under the law. Edit this resource to customize it for your own organization. Yes! Send me the FREE Sample Policy! Standards for job continuation after FMLA leave. FMLA Sample Policy also includes a customizable sample letter to notify an employee of their FMLA leave. This example policy will show your organization the proper way to comply with the FMLA, prevent misuse of the act by your employees — and help you avoid costly lawsuits.